The existence of software acquisition and implementation failures and their associated costs are very well known, and most companies are very familiar with them. Every company dreads replacing or upgrading business software, especially an ERP system. The vast amount of material available regarding software implementation project failures, especially ERP, true as most of it is, tends not to be framed in terms of what has to be done to prevent it. 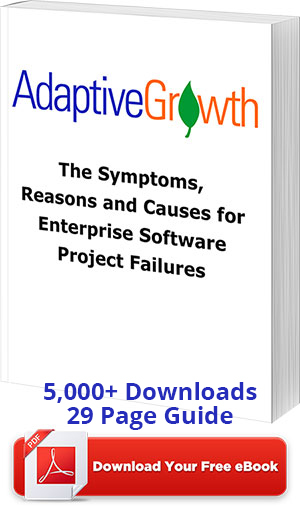 Contact us to evaluate how Adaptive Growth’s approach to preventing project failures, especially enterprise software project failures could save your business thousands of dollars on its next project.